Thank you to Pink Umbrella Books for the free review copy. All opinions are my own! In my opinion, all kids are superheroes. Seriously. They have to deal with a lot sometimes! But some kids might have a harder time seeing themselves as superheroes than typical children. 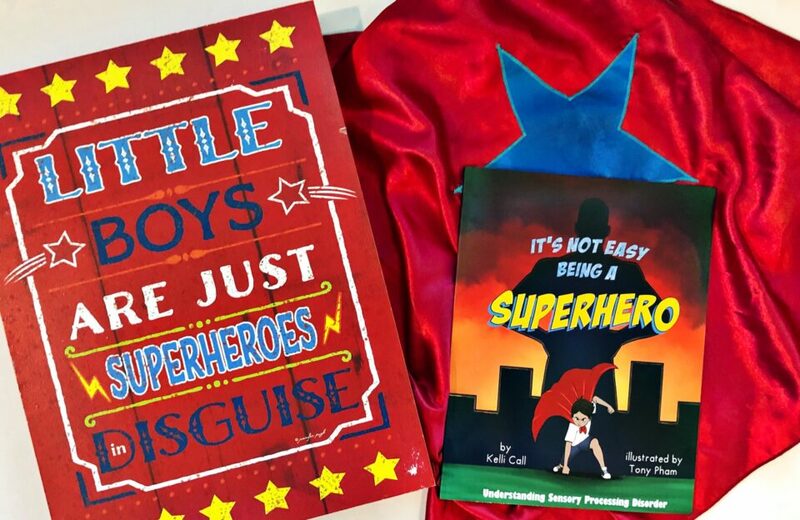 Kelli Call’s It’s Not Easy Being a Superhero is for them, and for whoever else wants to learn about what it’s like to have very special powers. Unlike most superheroes, Clark’s superpowers aren’t a secret. And instead of just one, Clark has five superpowers he must learn to control: super hearing, super sight, super smell, super taste, and super feeling. He uses his five superpowers to defeat sensory triggers, and his arch-nemesis Igor Ance. This beautifully illustrated picture book helps parents, teachers, students, and friends understand what it’s like for these superheroes who have sensory processing disorder and the tricks they learn to control their powers. This book is absolutely amazing. If you have a child with SPD (Sensory Processing Disorder), they will see themselves in Clark, and recognize their own superpowers. If you don’t have a child with SPD, this book will help them to understand what SPD is, why those kids are special, and what they can do to support those special powers. This is such an empowering book, written in a large comic book format, which makes it easy for all ages to read and comprehend. I truly think this book should be in all libraries, both at school and home. Every child deserves to see someone like them in a hero role, and It’s Not Easy Being a Superhero gives kids with SPD that opportunity. This book is wonderful!